The item Blood rock, (electronic resource) represents a specific, individual, material embodiment of a distinct intellectual or artistic creation found in Austin Public Library. Dakota Frost is back, and the ink is about to hit the fan-again. Graffiti comes to life in the dark heart of Atlanta's oldest cemetery, slaying one of the city's best loved vampires before the eyes of his friend Dakota Frost. Deadly magick is at work on the city's walls, challenging even the amazing power of Dakota's tattoos to contain it. The hungry, graffiti magick loves to kill, and the Edgeworld is no longer safe from its own kind. Dakota begins a harrowing journey to save those she loves and to discover the truth behind the spreading graffiti-even if that truth offends the vampires, alienates the werekin and creates police suspicion of her every action. Saving Atlanta may cost her everything, including custody of her "adopted" weretiger daughter, Cinnamon. But failure is not an option. If the graffiti isn't stopped, Cinnamon could be the next victim. 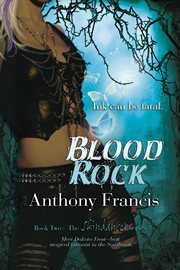 Epic Award winner Anthony Francis writes the Skindancer series while working fulltime for "that famous search engine whose name begins with a 'G'."